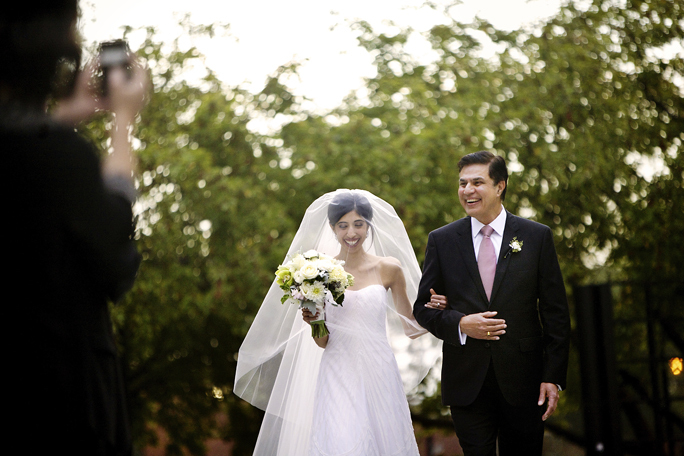 Every time I met with Pooja and Chris leading up to their big day on September 28th, it was so clear how in love they were which made me all the more excited to be a part of their special day. 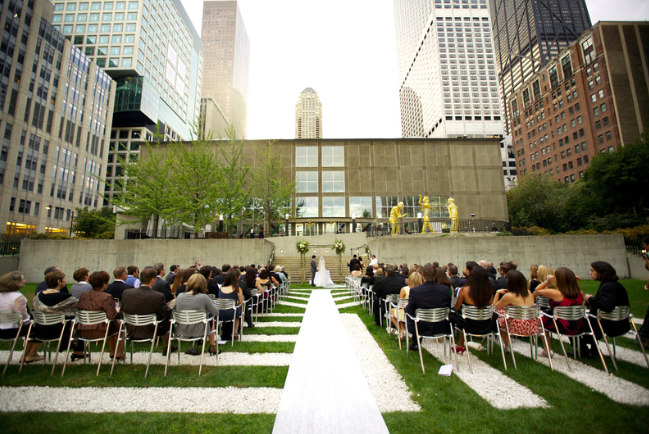 They’re both big fans of modern art, so the Museum of Contemporary Art was the ideal setting for both their ceremony and reception. To keep with the theme of modern art, we stuck to linear elements with the table settings. 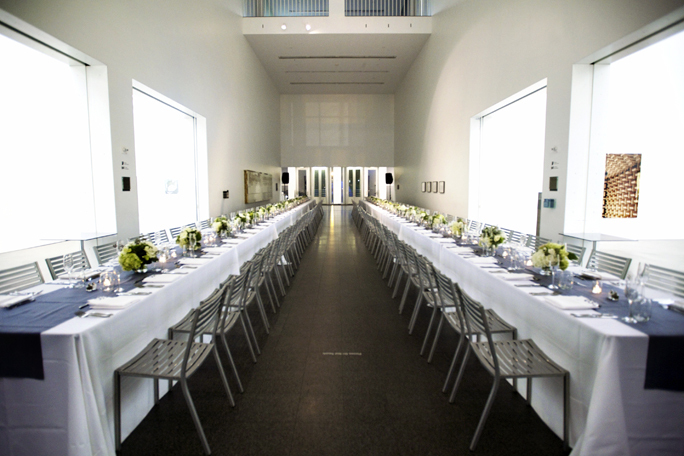 There were two long King’s tables, that each accommodated 66 guests, situated in the center of the two featured art galleries at the MCA. 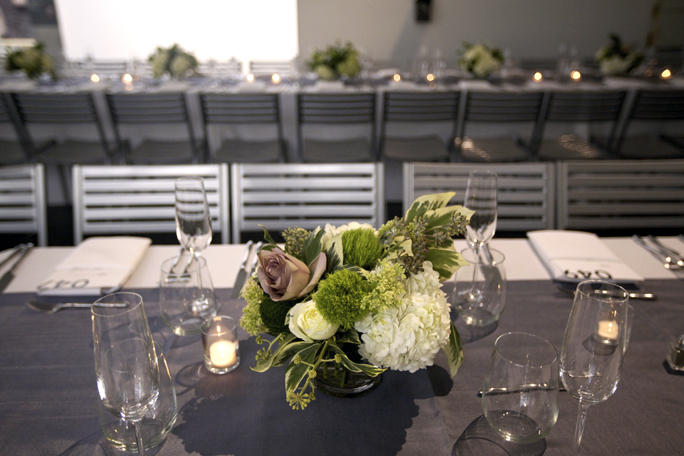 Down each of the long tables, Sprout brought Pooja’s vision of modern elegance to life. 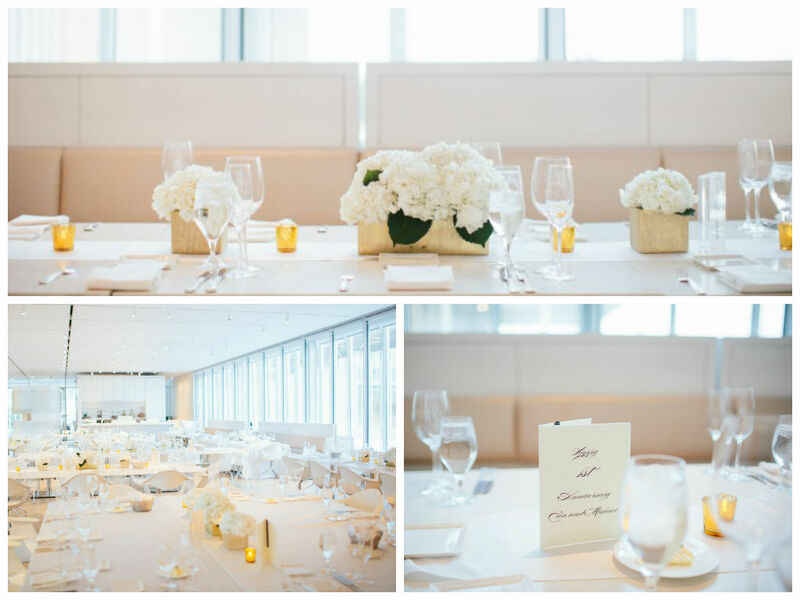 The flowers and decor stayed true to the minimalist and sophisticated theme. 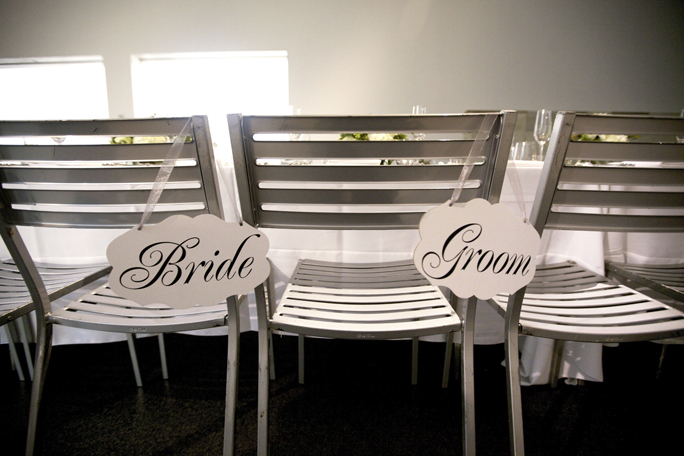 The color scheme included bright green, ivory, blush, and gray which we situated in a line on top of a gunmetal gray runner to create a striking line down the long table. 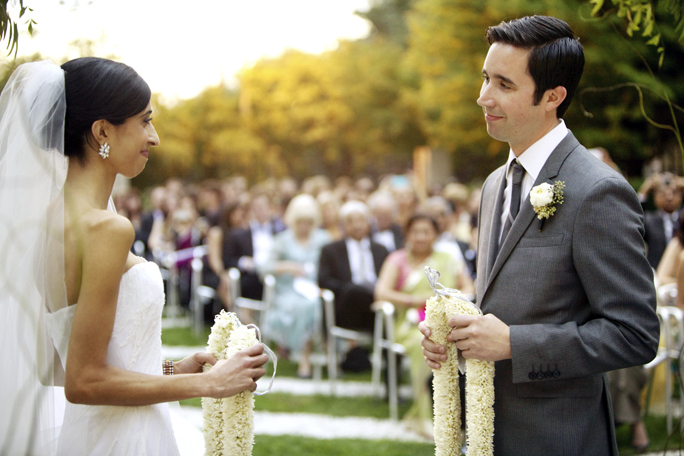 In addition to incorporating the art into their wedding day, Pooja and Chris also made the menu a priority. Wolfgang Puck Catering customized the menu, all the way down to the cake. Since they couldn’t decide on one cake flavor, Wolfgang Puck Catering created a plated trio of cakes to bring in all of their favorite desserts: mini carrot cake, banana cake with chocolate ganache filling, and strawberry tart with pistachio crust. Chris designed all of the paper goods – everything from the invitations to the menus and programs. He even created a personalized CTA rail map itinerary that was attached to each of the guests’ welcome bags. He went the extra mile to create individual menu cards for each guest. 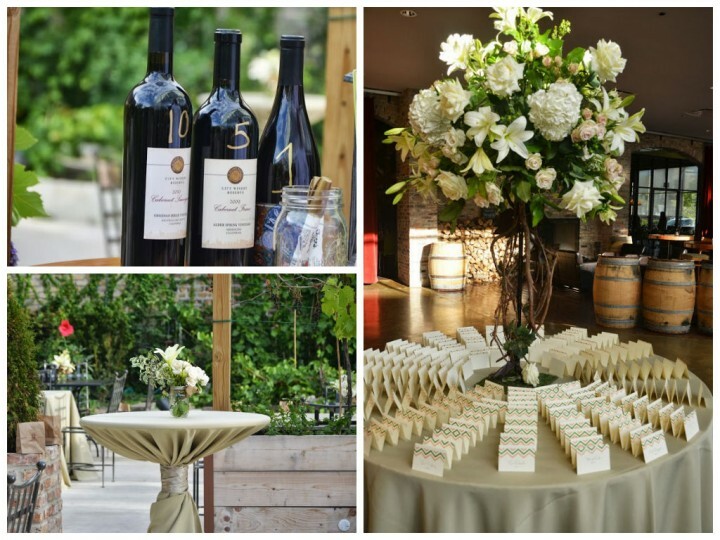 When each guest sat down, the menu in front of him or her included their name, their placed card number, and listed out the specific entree that they selected. It was such a great way to utilize Chris’ talent and to make the guests feel special! 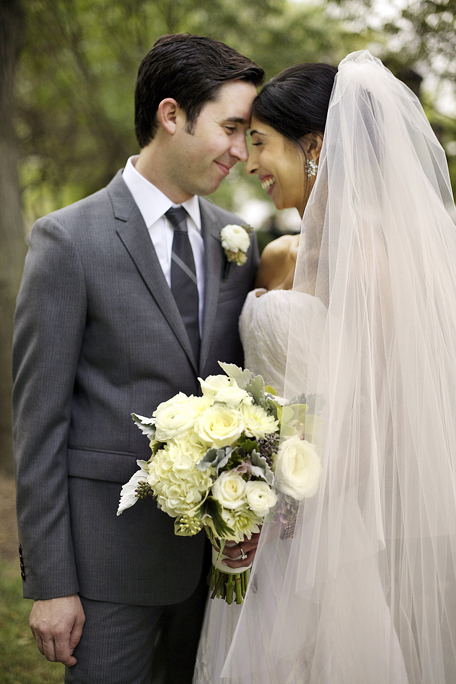 The entire wedding was beautiful and I am so happy to have had the opportunity to work with this couple. 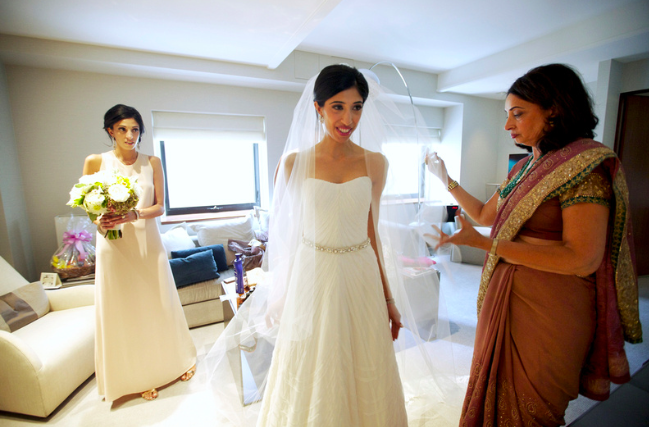 I still can’t get over Pooja’s Nicole Miller wedding dress, the grand exit among sparklers, and the vintage white Bentley that they rode off in at the end of the evening! 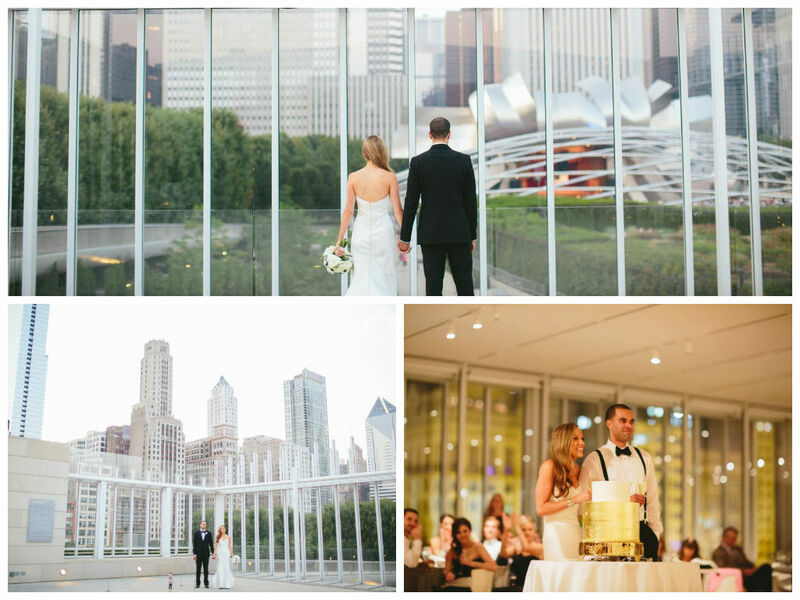 For Sally and Andrew’s September 14th wedding, we uncovered some unique and special aspects of Chicago, from taking photos at one of the city’s famed landmarks to tasting wonderful local wines. 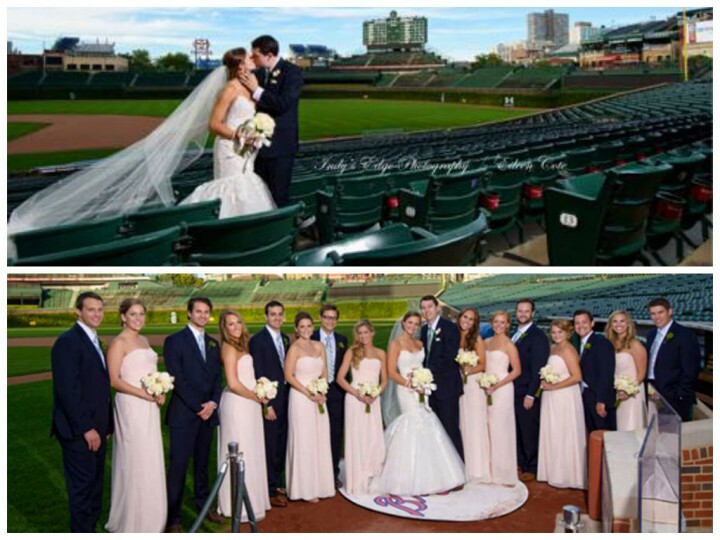 Following the ceremony at First United Methodist Church, Sally and Andrew, who met at Indiana University, and their bridal party stepped out onto Wrigley Field for photos that’ll be appreciated by every Cubs fan. Next stop: City Winery. As guests arrived, they signed wine bottles that were labeled numerically. Sally and Andrew will open and enjoy the bottle on the accompanying anniversary, which was such a great way to tie in the winery setting. 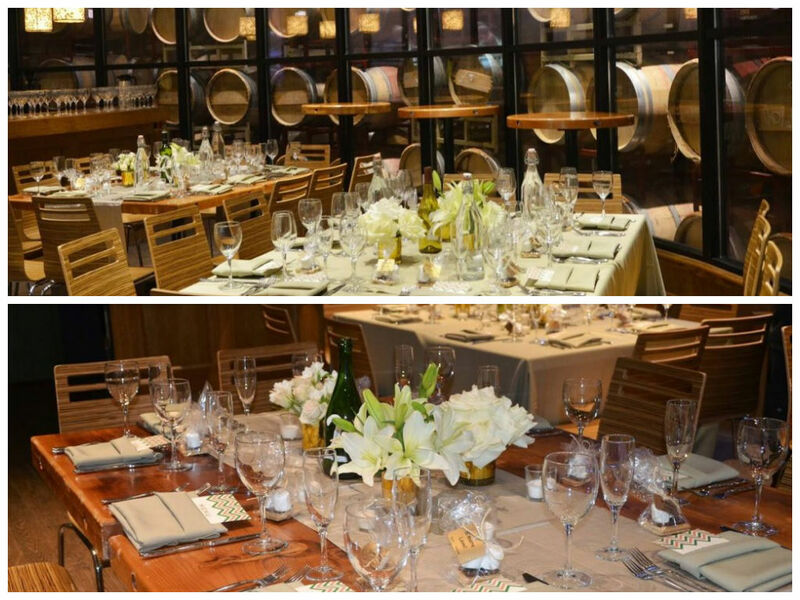 The overall feeling of the evening was rustic and natural. 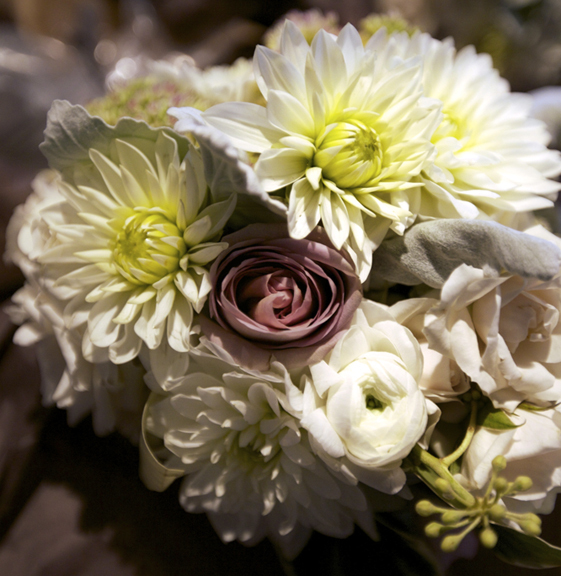 This translated into khaki-colored linens and burlap-wrapped Mason jars filled with lush green, white, and blush arrangements done by Virginia Wolff. The Michael Buble lookalike behind the microphone, and the rest of the Blue Water Kings, played as guests danced. 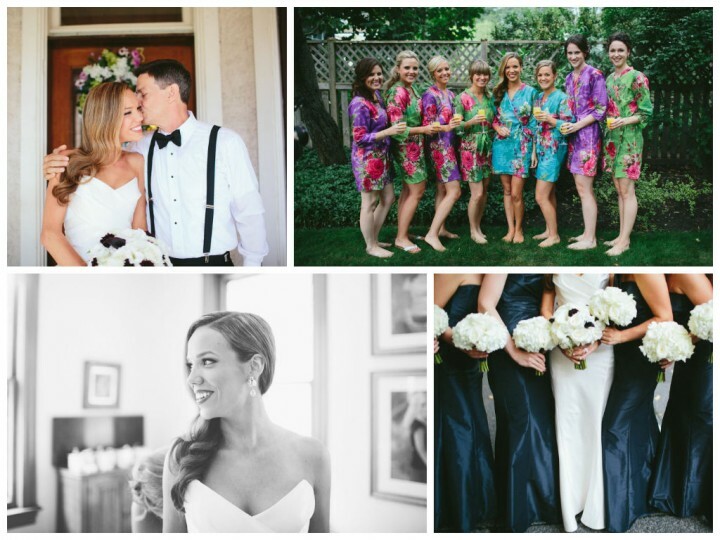 Sally and Andrew were intent on choosing a really amazing band – and that’s exactly what they got! When everyone had worked up an appetite, we passed each guest a package labeled “s’more love.” Inside, we packaged everything needed to make the perfect late night snack and welcomed everyone to the s’more station for roasting. 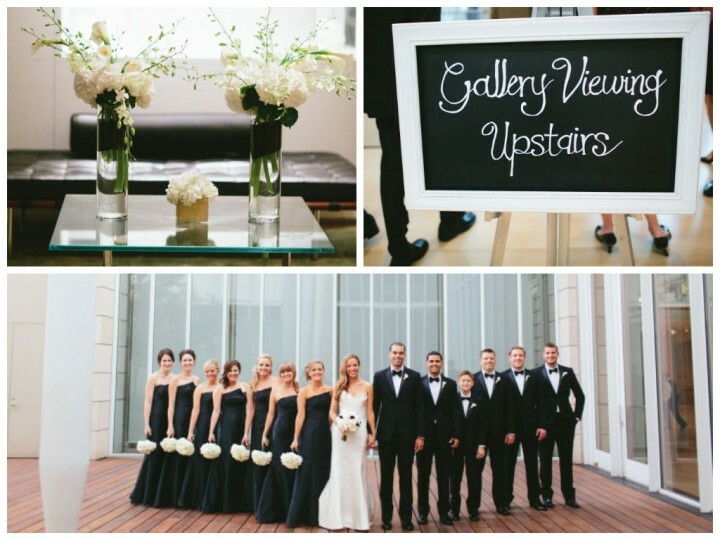 Sally and Andrew’s wedding day perfectly combined rustic details and the city. 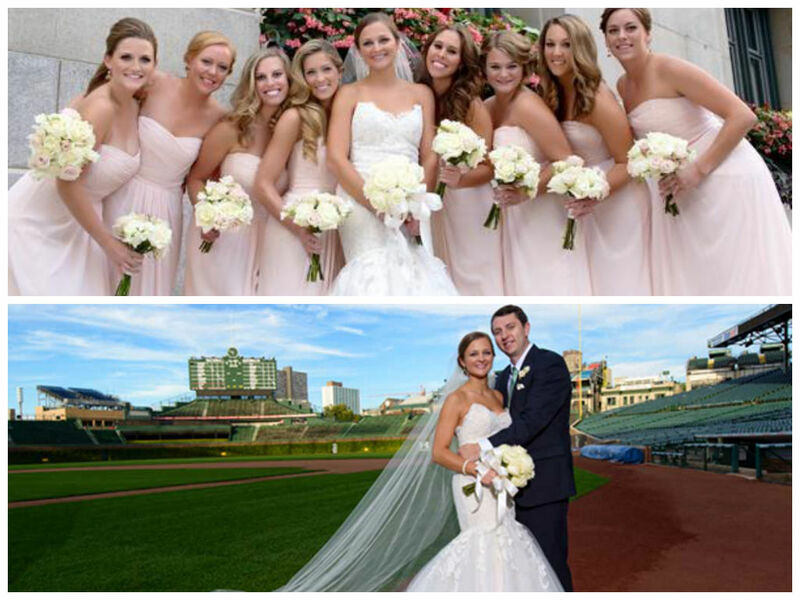 I was so honored to be involved in their big day. 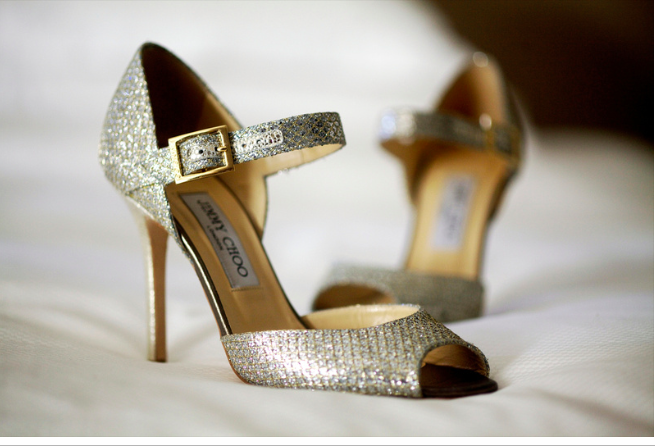 Cheers to Sally and Andrew! 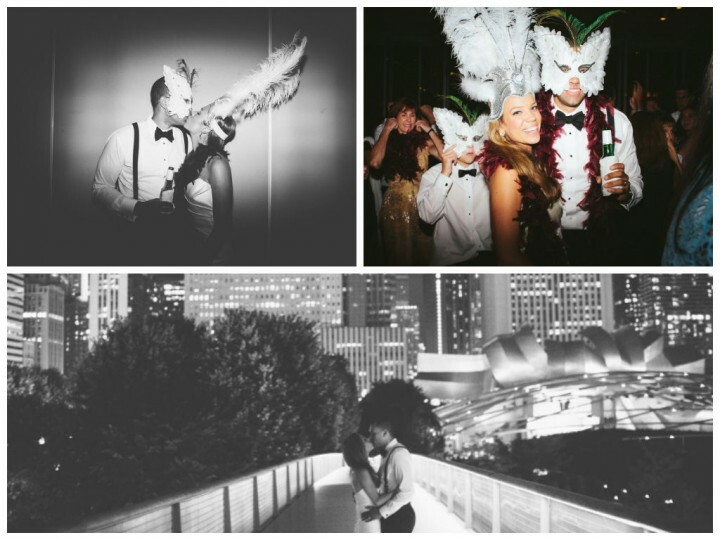 The best weddings are the ones that truly capture the couple’s personality and transform them into an event, don’t you think? When I first met Erin and Michael five months before their September wedding, I was drawn to their energy and their love for their families. Conveying their liveliness was goal one. I wanted the whole evening to be one that their families—including Erin’s family who traveled from Argentina to Chicago for the wedding—would recognize the couple’s personalities shining through. 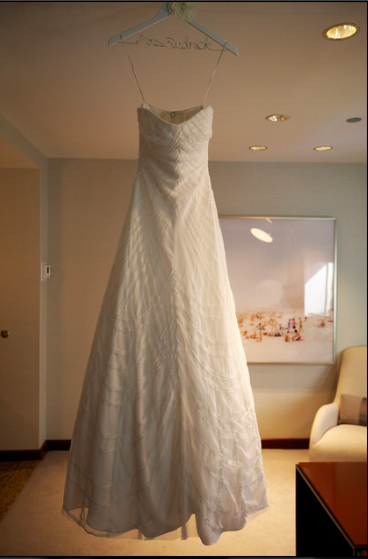 Erin emphasized the importance of family in our meetings leading up to the big day. 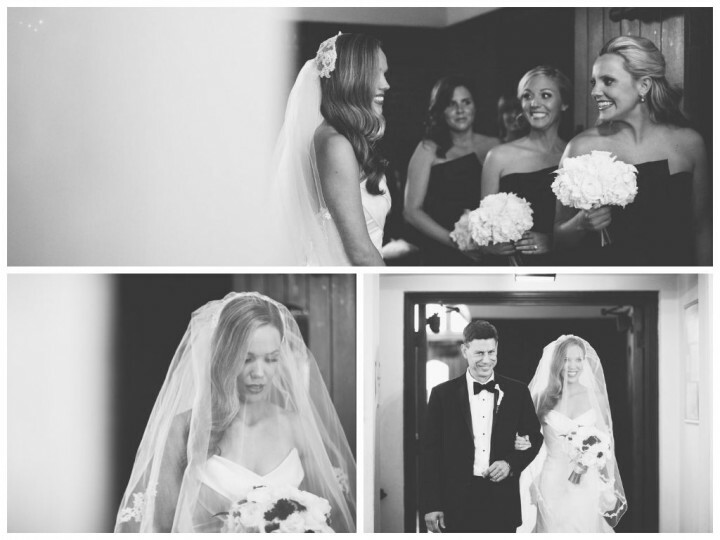 From their friends who sang at the ceremony and the cake cutting to Erin’s gorgeous veil that was in the exact same condition from when her mother wore it, little details sprung up throughout the evening to bring it back to family. The overarching theme mixed vintage glamour with modern touches. White and gold carried through every element—like the gold mercury vase votives at the center of the tables, the white runners, and the white hydrangeas set in gold vessels. The reception was at the Art Institute of Chicago, and guests had the opportunity to enjoy cocktails, wine, and hors d’oevres while viewing the museum galleries. 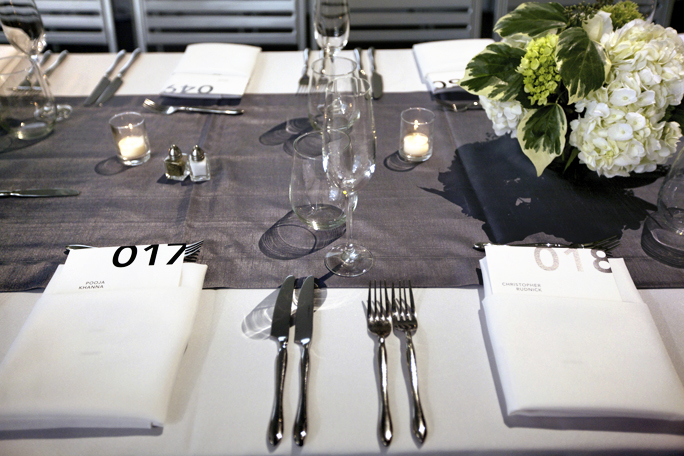 Each cocktail napkin was customized to share a statement about Erin and Michael, so even while guests were mingling and enjoying the art, the spirit of the evening was never far behind. 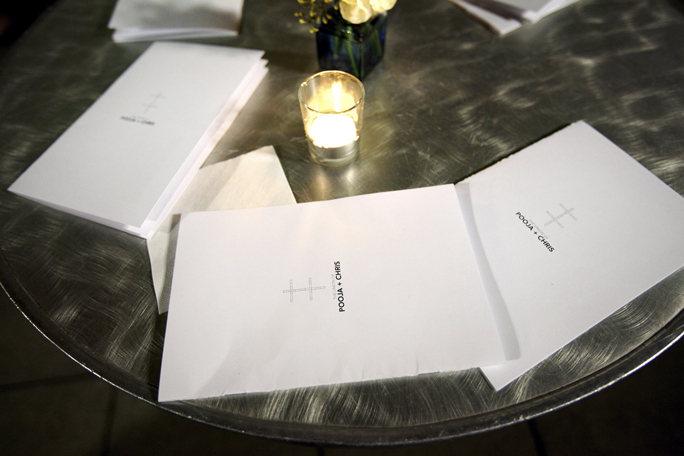 Another unique detail: guests were invited to write letters to the couple, and we organized them by table. 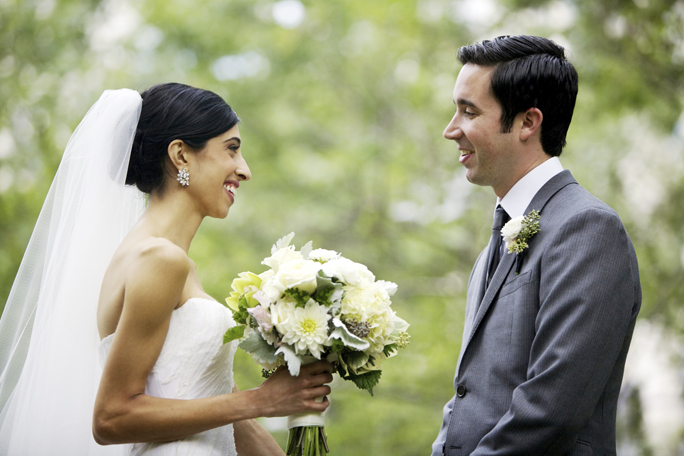 On Erin and Michael’s first anniversary, they’ll open the letters from table 1, and table 2 the year after that, and so on. 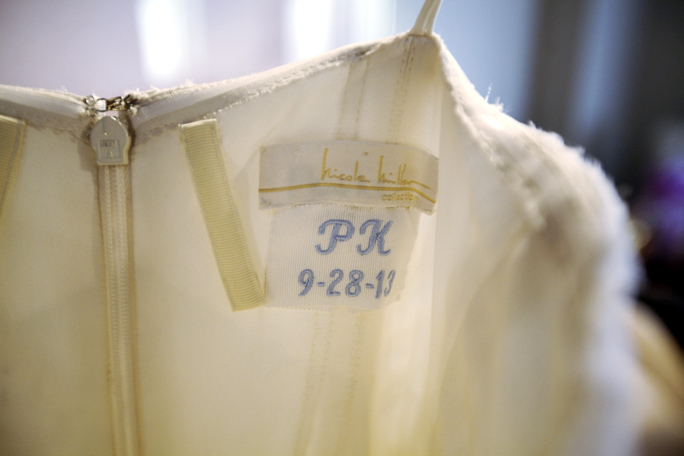 What a perfect way to keep the memories of the wedding day paramount! At 10:30 p.m., the “Hora Loca” began. My team and I shared masquerade masks, boas, and other props that Erin’s friend brought in straight from Argentina. An awesome dance party ensued, living up to the “crazy hour” name. 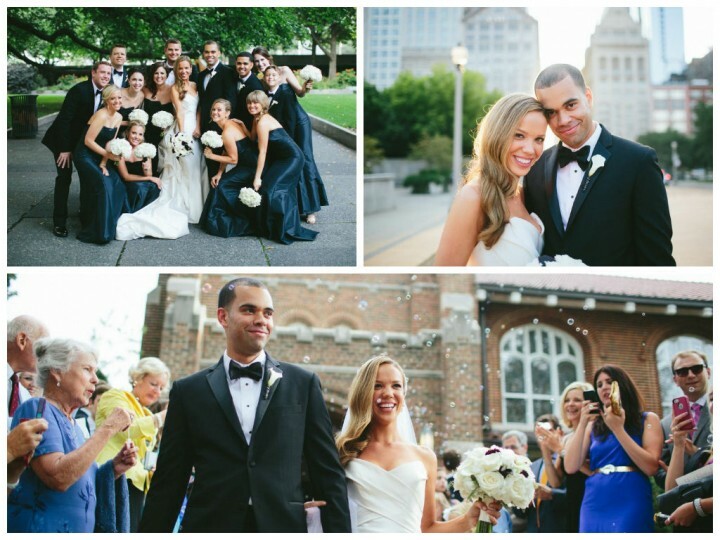 The beautiful couple left the reception with a grand exit: a horse drawn carriage took them away. The perfect ending to the perfect night! Congratulations Erin and Michael!